1. Jump into our arms on command. This is the favorite trick of our two mother cats, and they do it almost every day. As a result, all the babies know it by the time they are ready to go, as they love to copy mom. It is so much fun to see a little kitten doing this trick. When they start learning it, they are still too little to jump much higher than our knee, so we start there, and then give them a boost with a chair or the bed. Every one of our kittens can do this trick by the time it is ready to leave. 3. They know their names, and will come when called. 4. Tucket says "Gesundheit" when you sneeze. Actually, it’s sort of a "Mrrrah" noise, but it’s the same sound every time, and she does it almost every single time someone sneezes. 5. Pyewacket enjoys opening drawers, and wiggling inside. She can only do the ones that glide open smoothly, like in the bathroom vanity. She taught the babies from her last litter to do this, and it was pretty amusing watching them line up to take a turn at swinging the drawer open. Every single one of these kittens is adorable, with great looks and winning personality. Some visitors have spent over two hours (!) trying to decide which kitten to take home. Most people don't take quite that long, but it can be really tough to choose among an abundance of riches. People even had lots of trouble narrowing it down to two kittens. Usually, if you have a couple litters of kittens, it isn't hard to pick out a few "favorite" kittens, which are usually also the first to go, but not this time. Not a dud in the bunch. In fact, a couple of the kittens that *we* really thought would have been the first to go, were the last. They were all that good. Our parent Tonks have very diverse genetics, and we provide a highly enriched and socialized kitten environment, so that might have something to do with it. We like to follow up with our adopted babies, and some of the stories that are reported back are pretty funny. One favorite is something a Natural Mink boy named Biscuit came up with: Biscuit lives with a German Shepherd dog named Mr. Dudley, and he seems to have worked out some kind of deal with the dog. Biscuit jumps up onto the high shelf where a jar of dog treats is kept (previously well out of unauthorized canine reach); knocks the lid off the jar; pulls out a bunch of treats; then bats them off the high shelf to the dog waiting below. Dog munches treats. Owner comes home to find jar lid off and the jar half-empty; a few left-over treats scattered on the shelf that didn’t quite make it down; and a very full and happy dog. Owner Betsy still hasn’t quite figured out what Biscuit gets out of the deal, since he doesn’t care for the dog treats himself, (though he has been known to play with them.) But Mr. Dudley is very happy! While we’re on this topic, we’d better warn you; these cats are a lot like little monkeys. They can manipulate things with their paws very cleverly, and they have a magpie-like attraction for small, shiny things. Once, Don was trying to put a bookcase together, but Tucket kept stealing the screws. She would very deliberately pick them up with her paws, inspect them carefully, then transfer them to her mouth, and trot proudly off, with an air of pleased acquisition. So, please keep your rings and other portable jewelry safe in a box or drawer, and the cats will be satisfied with collecting paper clips, pen nibs, and such like. 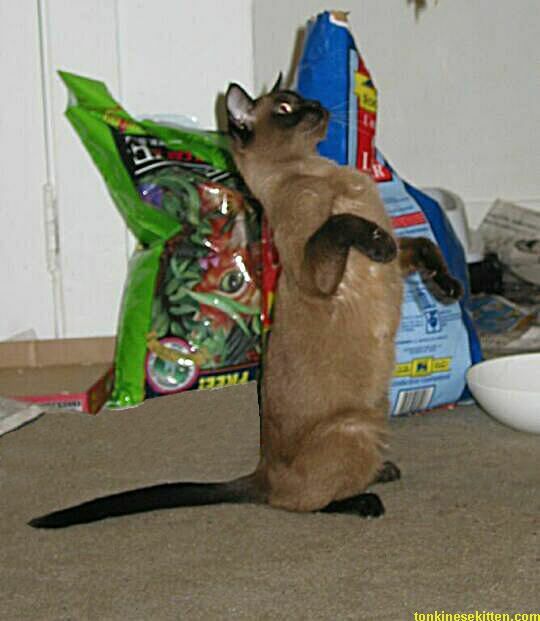 Tonkinese are still cats, not quite dogs, so be aware you can’t usually expect 100% success rate for trick performance; for example, the jump-into-arms trick has about an 80% success rate; if the cats are too tired, or really not in the mood, they won’t do it. You can tell that they know what you want them to do, they just don’t feel like doing it right then. If you persist, they'll tell you , too. But success rate also depends on the trick; Tucket is near 100% on the "Gesundheit" trick. The following links can give you some good general authoritative background information on personality, looks, and other Tonkinese characteristics. Quite often the Blue Point and Blue Mink look alike as kittens, but different as adult. Same for the Platinum Point and Platinum Mink. We’re getting pretty good at telling what color our babies will grow up to be, but for a few of the coat patterns, it’s never a sure thing until they reach a certain age. From the Companion Cat Registry web site: "CCR does not promote showing. CCR promotes raising healthy, happy companion cats. CCR will not try to tell you whether your cats look good. We think breeders and buyers can judge this for themselves. If your customers are satisfied, you have a more important measure of successful breeding than a Championship. After all, a Champion might be a lousy pet." That kind of sums up what we’re after; breeding with at least an equal emphasis on intelligence, good health, and personality instead of just how the cat looks. They’re very beautiful cats; check out the pictures--but we think it’s even more important how loving and intelligent they are. 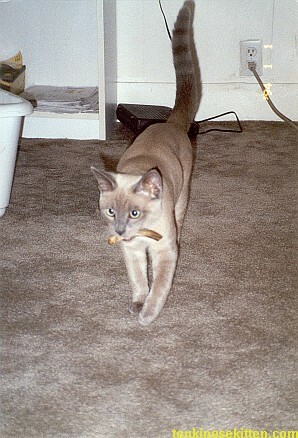 My first cat was a Tonkinese; and she lived to be 23 years old. Check out other Tonkinese web sites; they concur that this breed tends to be long-lived and healthy. We think that’s important, because this is a cat that people bond with for life. We don't sell any kittens until we're sure they're really ready to leave Mom; for many cat breeds, that is usually around 12 weeks to 16 weeks. But Tonks can mature early, so some of our babies can be ready to go as early as around 11 or even just over 10 weeks. They get so much stimulation and human contact, and since an enriched environment can speed up maturation, the kitten is both physically and emotionally at least a 12-week old, even if it is chronologically a little younger. We never let anyone go earlier than a little over 10 weeks though, no matter how big and sturdy they might be. We decide on the individual kitten basis; for example, the sturdiest biggest kitten (we called him the Magellen baby because he was the first adventurer out of the box, and always exploring all over the place) might have been ready to go at just over 9 weeks; we kept him until over 10 weeks though. By then, the mother cats were practically begging us to let him go. They had fully weaned him, but he was so big and strong he could practically wrestle them to the ground for a little unauthorized nursing. At the other extreme, Rindy (the tiny runt) was not ready then, and she needed to stay with her mother beyond 12 weeks. But, we let people come and play with the kittens and reserve their choices before then. Just please, do not visit any other cattery or other cat home on the day you come see us, and especially no contact previously that day with any cats that might not have all their shots. We will also ask you to wipe your hands off with disinfectant alcohol we provide, before playing with the kittens. We have healthy happy kittens, and would really like to keep them that way. Once in a rare while, we get a call from someone who sees the price of the kittens and thinks to themselves "Wow, easy $$$ money $$$! I have to get into that!" Then they call us with the idea of setting themselves up farming kittens at home in their bathtub or something. Please don't do that. The only people who think that are people who have never actually done any serious kitten wrangling :). First of all, it's NOT easy; it's a lot of hard work. If we were in this for the money, we'd have have quit after the first litter. We're just that sort of crazed cat people who periodically delight in having a clather of kittens bouncing around the house, and we're willing to pay for the privilege. Believe it, after all the top-quality kitten food, vaccinations, vitamins and supplements, cat litter (the cat litter expense alone can be astounding!) . . . it adds up faster than you'd think possible when you're dealing with a whole litter or two of kittens. The time invested is immense; on a dollar per hour basis, you'll make a lot more money delivering papers than kittens. If you're pressed for time or have any health issues like some of us do, you'll have to hire a lot of help, especially with the scut work. It's not the sort of thing you do at all if you're expecting to be financially recompensed for the amount of time put in. It's the sort of thing you do because you find it worthwhile and fun. (Maybe if we charged ten times the price this would be a genuinely profitable venture, but we don't think there are quite that many multi-millionaires out there desperately yearning to pay top dollar for Tonks.) And if you think you can cut corners on any of that, you won't get a kitten that compares to ours, and that people are happy to pay for. It's not just the mother cats that need to rest up for a while after the yearly batch of kittens :) . Finally, while we have been very lucky, many breeders have devastating stories to tell. Our mother cats have always sailed through pregnancy and delivery, but that isn't always the case for everyone. So, even if your set-up is logistically ideal in many ways (say, a strong and mature resident 12-year-old child who's willing to take on twice-daily litter box detail) just one Caesarean or other complication can wipe out all your profit and then some. We have concluded that there are some things in life that have happier results when undertaken as non-profit or break-even ventures. That includes institutions like hospitals (Is there anyone out there actually happy with managed care? If you are, DON'T call us to tell us about it; you scare us. ), universities and education; and breeding Tonkinese kittens. You may have a different opinion. That's fine. Just don't try to involve us or any of our kittens in gauzy dreams of wealth through kitten husbandry. We're not entirely opposed to our kittens being bred. We're proud of our genetics; the founding parent line is very diverse and well-known. We can relate to feeling so delighted and amazed at the sheer all-around-wonderfulness of your Tonk that you say to yourself "I've just got to make a few more of these." That's the bug that bit us, too. And we won't try to tell you a thundering herd of Tonkinese kittens galloping across the sweeping vista of your living room isn't one heck of a lot of cuddley fun; of course it is. Few things are more fun, cute and all-'round adorable than a Tonkinese kitten, and an entire litter all at once . . . you'll hardly be able to stand under the immense cuteness overload. But we insist that people have at least some real idea of what they're doing and getting into, if they're planning to go there with one of *our* kittens as a foundation. And we can usually tell after a short conversation, if it's likely to work out well for everyone, particularly the kitten. So, if you're a genuine cat lover, and seriously think you want to be part of adding a few more top Tonks to the world in a home-raised environment, we'll talk. But it's not something you're ever going to get rich at; quite the opposite. We will continue to update this website (eventually), putting up lots more pictures, a few movie clips and other fun stuff, along with Tonkinese breed information and general cat information. One of these days there should be a special section on cat pregnancy, birth, and infant kitten care. You can expect updates maybe every month, and more often during random bursts of creativity. If you want to be notified on updates, let us know. Then, when we have kittens again, we will post new pictures and update frequently as they grow. If you would like to be on our adoption waiting list, email us at deborah@tonkinesekitten.com.